More and more companies are starting to take a more green eco friendly approach to marketing. It is about time! One such company is Green Toys! They make eco friendly toys that are made and packaged with recycled materials. Green toys can be bought lots of different places these days such as Amazon, Walmart, Target, and other online retailers. They do also sell them on their own website. Plus from time to time, they even come on sale. Amazon often has them on sale for as much as 50% off! Green toys are made 100% in the USA. That not only allows them to monitor the products being made and what they are made with, it helps to cut down on greenhouse gases. You have to love when a company is green in so many different ways! The toys are made from recycled plastic from milk jugs, yogurt cups, and other recycled plastic items. The plastics are collected from waste and recycle centers (from your recycled items) then taken and cleaned then shredded into flakes that can be made into toys. They also package all of the toys in 100% recycled cardboard cutting down on waste even more. You may be worried that by using recycled items that the toys may not be safe. That is not the case with Green Toys. They take toy safety very seriously. The Green Toy company is based in California where the safety laws are known to be strict. Even with the strict laws, their toys surpass the US laws for BPA and Phthalates. 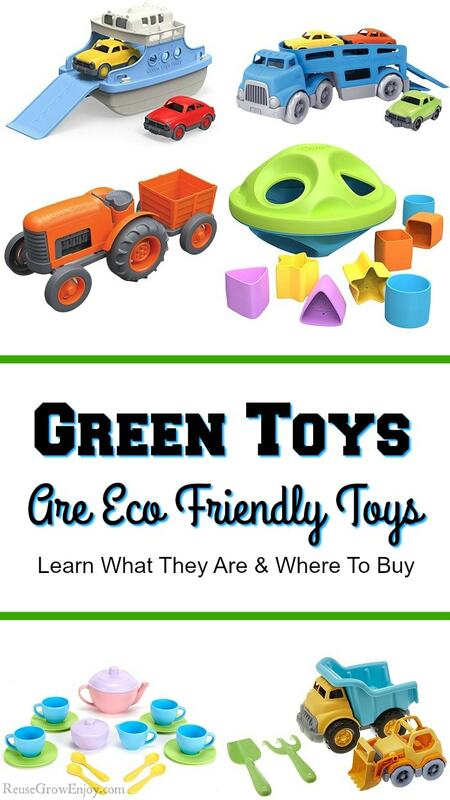 So the next time you want to buy your little one a new toy, try getting Green Toys. Not only will they have a blast with it, they hold up well and you will also be helping keep trash out of the landfills. Do you have another green company that you love? I would love to hear them in the comments below! Looking for other eco friendly toys and crafts for kids? Here are a few posts to check out. Green DIY Slime – 100% Natural No Glue And No Borax! I was in no way paid by Green Toys for posting this post. I do however make a small % if you buy any items after clicking links in this post.